So, if you’re up for an inspiring talk about urban farming, join us Friday 25th of August! ØsterGRO is, without a doubt, one of the most beautiful spots in Copenhagen with 600 m2 on top of Copenhagen’s oldest car auction house, the Nellemann house. ØsterGRO offers a vegetable field, bees, greenhouses, chickens, rabbits, compost and an outdoor kitchen. 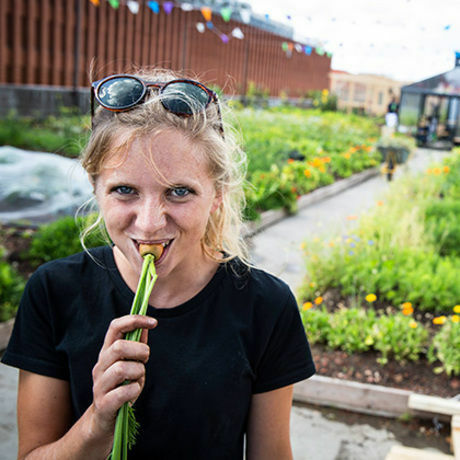 The vision behind ØsterGRO is not only that cities in the future should be self-sufficient with food grown on the roofs - but also to create a link between the land and the city. If you haven’t been there yet, you’re in for an eye-candy treat!